If you are in the mood for pizza, be sure to use one of these Papa John’s promo codes and coupon codes to save money. Here’s a new Papa John’s promo code for ya! Through January 28, you can pick up any pizza at regular menu price and get a second of equal or lesser value FREE when you enter Papa John’s coupon code BOGO18 at checkout on PapaJohns.com! 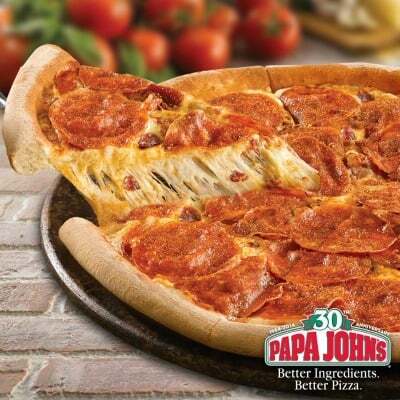 For a limited time, you can also use the Papa John’s promo code POST3M to snag three medium three topping pizzas for only $21 on PapaJohns.com or you can grab 25% off your regular menu priced online order by entering Papa John’s promo code VISA25 or SAVE25 at checkout. The other Papa John’s 50% off coupon codes have expired, but when new promo codes are released, I’ll be sure to share them as well. Please note: Some Papa Johns promo codes are regional and may not work in all areas. Unfortunately, you cannot use multiple codes together. Which Papa John’s promo codes or coupon codes will you be using? Are you aware of others? Please share in the comments.